The chances of having a 100 percent healthy diet are as likely as the possibility of growing your own fruits and vegetables in a 2-bedroom apartment. Nevertheless, it is not impossible to lead a balanced life sustained by vitamin-packed foods. Unfortunately, there are many “posers” out there, tricking people into believing that they are eating healthy when, in fact, they are filling up on flavor enhancers and harmful oils. To this extent, we have compiled a list of 11 food items that confirm the adage looks can be deceiving. While many prefer to replace a good old loaf of bread with a couple of pieces of crispbread as the latter looks healthier, it is not always the truth. Unfortunately, many manufacturers use things like preservatives, dyes, and modified starch when producing it, individuals ending up eating food that looks, tastes, and has the nutritional value of a piece of cardboard infused with harmful oils and preservatives. Healthy replacement: Whole-wheat crispbread with no additional dyes, preservatives, yeast, and modified starch; whole-wheat or whole grains bread. Speaking of bread, gluten-free foods have become a trend, lately, a concerningly high number of people who do not suffer from celiac disease choosing a gluten-free diet without realizing the risks they are exposing themselves to. Gluten is a protein found in most grains. It only affects about 1 percent of the entire population of the planet – those suffering from gluten intolerance. When people who tolerate gluten replace bread with a gluten-free variant, they actually give up on eating a healthy meal while imbibing themselves with the plethora of refined additives that replace the protein. Banana chips are relatively healthy as they contain magnesium, iron, potassium, and food fiber. However, the majority also contain plenty of sugar and flavor enhancers. Moreover, not all banana chips are cooked in the oven, manufacturers preferring to deep-fry them. Healthy replacements: bananas or homemade banana chips baked in the oven (keep in mind that homemade banana chips will not be as sweet as their sugar-packed commercial counterparts). While banana chips still contain some vitamins and nutrients that are undeniably beneficial for the body, vegetable chips are among the biggest posers on this list. Usually, a bag of vegetable chips contains sweet potato, carrots, beetroot, parsnip, and kale. In order to make them taste as delicious as they do, manufacturers add more than a dash of salt, sugar, and flavors. More than often dyes are added into the equation. Healthy replacements: if you don’t have the time to bake your own vegetable chips, you can always chop fresh vegetables and dip them into a home-made yogurt dressing. 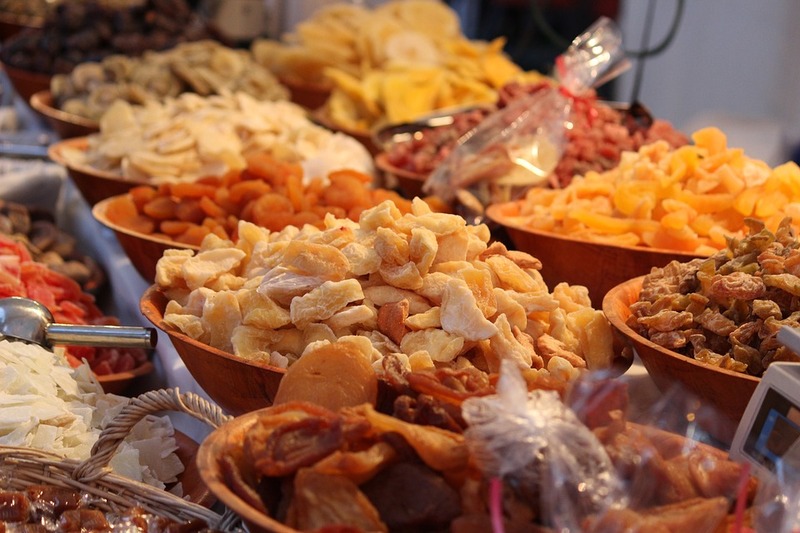 Candied fruits usually contain high amounts of sugar, a single piece satisfying the daily recommended dose. Dried fruit can go bad as quick as regular fruit. To avoid selling bags filled with moldy dried apricots, manufacturers usually add sulfur dioxide and fungicides to their products. It’s true that caned fruit and vegetables are considerably cheaper and longer-lived than the unprocessed items, a can of vegetables of fruit contains more than enough sugar, vinegar, and barbecue sauce. Healthy replacements: if you don’t afford to always buy fresh and risk the food to spoil, canning fruit and vegetables at home is always a healthier option. Not all vegetables are healthy, some bringing more benefits than others. For example, starchy food items like pears, potatoes, corn, yams, and pumpkin offer more calories than minerals, fibers, and vitamins, meaning that they are best suited for breakfast or lunch. Healthy replacements: if you’re on a diet and counting your daily calories, it’s best to eat more leafy greens. However, starchy vegetables shouldn’t be eliminated from your daily meals, just opt for a lighter dinner. Processed cheese – especially the shiny deep yellow stuff found in cheeseburgers – is riddled with salt and other additives. Canned cheese is a definite no-no, and spreadable cheese has more additives than natural ingredients. Healthy replacements: cottage cheese, mozzarella, Edam, cheddar, and any other quality cheese products. As a general rule: nothing that contains the word instant is healthy. Instant oatmeal is no exception as the smaller the flakes, the more time it took to process them and enhance their flavor. Healthy replacements: coarsely ground oatmeal that, even though it takes a little more time to cook, packs plenty of nutrients and fibers. Fruit yogurt rarely contains actual pieces of fruit, but in abounds in preservatives, dyes, and flavor enhancers. Even more, to make it more appealing, manufacturers usually add extra sugar. Healthy replacements: natural Greek yogurt or yogurt with high levels of proteins and low amounts of sugar. Even though they have electrolytes – which are the new best thing – sports drinks are also rich in carbohydrates, artificial flavors, and even caffeine or taurine. They’re not health-hazard bad, but sports drinks can stress the pancreas into releasing more insulin than needed, ending up making the body feel more tired than if the person in question opted for a tall glass of water instead. Healthy replacements: water or freshly squeezed orange juice.